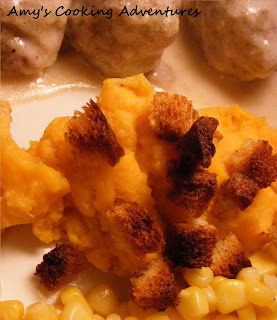 Around the holidays, I posted a recipe for Savory Sweet Potatoes, a delicious sweet potato bake that called for whole milk and a stick of butter. 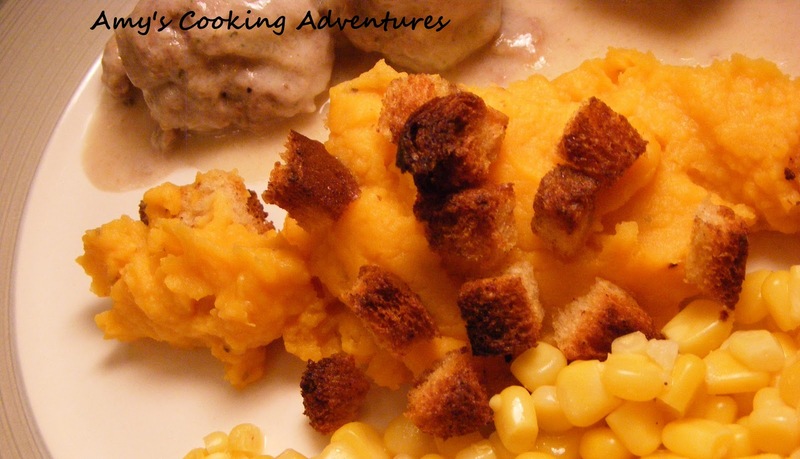 I wanted to bring this delicious dish to the dinner table any day, without the guilt. After all, sweet potatoes have many health benefits (vitamins A & C, beta carotene, and fiber), why drown it in a bunch of butter and fat? To make this a bit healthier, I reduced to butter to a single tablespoon of butter. I also used skim and whole wheat bread. This bake was just as satisfying as its higher calorie counterpart with none of the guilt! Combine sweet potatoes and red potatoes in a pot, cover with water and bring to a boil. Boil for 20 minutes or until tender. While the potatoes boil, mix together the olive oil ¼ tsp paprika, and a dash of salt. Toss the bread pieces in the olive oil mixture until evenly coated; set aside. When potatoes are tender, drain and place them in a mixing bowl. Using an electric mixer, blend the potatoes together until slightly smooth. Add the butter, milk, ½ tsp paprika and salt and pepper to taste. Continue blending until smooth. Scrape potato mixture into an oven safe dish and top with bread mixture. Bake at 400 degrees 15-20 minutes or until bread is lightly toasted. I hope you enjoy this Anne Marie! I am just learning to love sweet potatoes and thought this one was great!